Let’s face it! We all have a preoccupied life… Our daily life is all about waking up in the morning, rushing into the kitchen making breakfast for ourselves and our family, running off to work, getting back home exhausted and cranky, falling asleep in front of the TV and then repeating the same cycle (with some ups and downs) all over again, for the rest of our life. Well, try my version: some time ago I started combining my Master´s studies (which is a crazy amount of homework, essays, lectures and presentations), an internship at the United Nations and working in a hectic job, while I am writing my thesis and translating a book. In the past, I used to come back home, crawl up somewhere in my house and cry over this stressful situation. During this time, I felt miserable and even when I was trying to sleep I wasn’t able to as the nightmares were sneaking in to haunt me. But on one great day, it all changed. Being Curious Finally Paid off! It was a boring afternoon… I went to the kitchen to make tea and started surfing the internet looking for new internship opportunities. When I was surfing the internet I came across a website that was teaching self-development and inner peace lessons for free. I got curious and signed up. During the first lesson, I had to sit down for 30 minutes and try to think about nothing (It felt impossible as I had so much work to do). As the lesson went on, I categorised all the duties in my head instead of paying attention. I simply could not concentrate. But after 15 minutes, I was out of duties for the day and my body started feeling relaxed and I couldn’t feel my fingers (to be honest I freaked out, opened my eyes and counted my fingers before going back to meditation again!). After 30 minutes, I felt weirdly calm. It was in the afternoon but it felt as if it was six in the morning and that I was ready to wake up and start my daily routine. 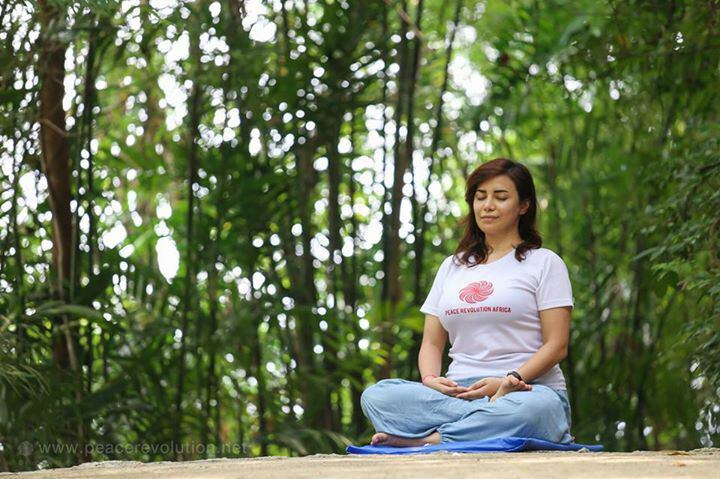 The main point of meditation method was learning how to “be at the center of yourself”. The whole concept was vague to me for a while. The teacher would count down steps to calm the body down and then ask us to find the center in our body. Yet every time I was thinking: where is the center?! One night it happened. I was dealing with some problems regarding my studies and was in a desperate need of some minutes away from reality. When I got home, I changed out of my uniform, lit some candles, closed my eyes and sat down in the lotus position ready to start meditating. After a few minutes, it happened just like that. I was there – in the center, looking at my meditation object (the moon). It gave me a feeling as if I was finally in my own home. I could not hear anything, I could not feel anything, I was not even thinking as I was experiencing a genuine silence from the bottom of my center and was listening to the delightful sound of “nothing”. This practice that I started out of curiosity suddenly became a daily habit. It was the only “me time” during the day. I could not wait to finish my work and studies, get back home and start my inner journey. After practicing the inner-peace lessons for 42 days, I started to experience unique visions. I was visualizing myself in my most favorite place on earth, sitting by the Yara River looking at the magical sunset. One day, my visions took me to a mountain, where I was looking at the clouds passing by, caressing my face. The next day I felt the center of my body, reaching neutrality and felt deeply relaxed. The feelings were so deep that I was afraid to tell someone in case they would spoil it! Little by little, it changed my behaviour. I was able to make better decisions, think more clearly and be more focused on my work and studies. How incidental it was that a small moment of curiosity could change my whole life! Want to be a Peace builder? Start with yourself! We all want to change the world. I used to be obsessed about United Nations, following their pages thinking, “Wow, these guys are changing the world! It’s amazing; I want to do that too”. However, if you had asked me back then, how I was going to pursue this ambition, I literally had no idea. I would simply be waiting for someone to tell me what to do instead of taking initiative myself. I believe it is great to have ambitions about changing the world, but now that I have more experience, I know that you can only achieve your goals if you start from within yourself. It is impossible to be a famous worldwide peace builder in one night. The most important thing is that you start somewhere, whatever method works for you. For me the inner peace lessons were very helpful. It does not have to take much of your time – 10 minutes a day is a good start and then before you know it, you are ready to change the world. How to begin your inner-peace journey? Before getting up: spread the LOVE to all beings. Previous PostPrevious How Can Inner Power Lead To A Successful Life?